Since her childhood days, illustration has always come naturally to Bernie Quah. But when asked if illustration could be considered her passion, she always denies it. 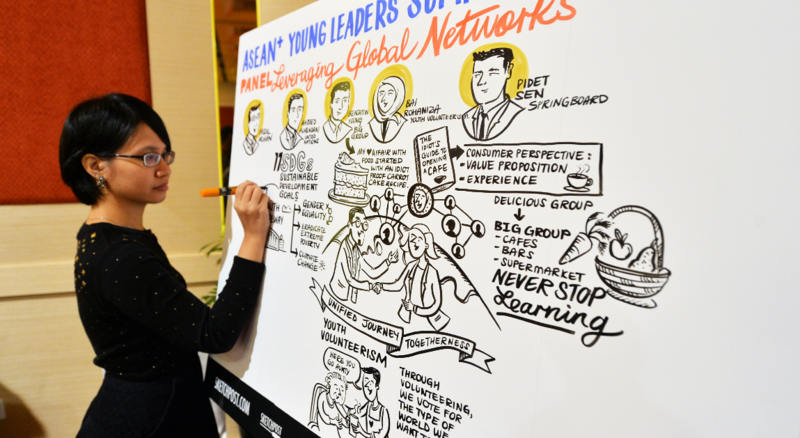 Her real interest lies in continuous learning, and graphic recording is simply a tool that helps her learn many different things while creating value for the people around her. “I found my skills to be most valuable as I attended conferences and began illustrating notes as talks and discussions went on in my notebook. It was an instant capture of key points and interesting quotes. Organisers, guests and speakers loved them and it was a beautiful way to celebrate the content and exchange of ideas,” shared Bernie. After living abroad in San Francisco for awhile, she learned that age shouldn’t be a factor when it comes to creating new ways of doing things and building a business around that idea. It was there where she was exposed to young adults who built their companies and was offered funding after dropping our of college. She figured there was no harm in giving it a try as she already had a good product and a great value proposition on hand. After a few years of practicing graphic recording as an interest, Bernie became confident in her work and decided to turn it into a profession by starting Sketch Post. Sketch Post is a service provided by a group of graphic recorders who are based in Singapore, Malaysia and Hong Kong but travel across the world to draw. The team provides graphic recordings to help simplify complex ideas in order to create easier engagement between people and helping ideas stick. The reason the name Sketch Post was chosen was because Bernie aimed to have a name with just 2 syllables that was easy to remember. “I wanted the name to be straight to the point of what we did. So I chose words that represent the 2 things that I like the most, sketching and posting things via snail mail,” said Bernie. Currently there are 3 members who are pursuing Sketch Post full time but they also have a pool of freelance designers for larger events. Their background ranges from interior design to political science. Bernie herself has been practicing art for 3 years while the rest of her crew has done it for 1–2 years. Bernie shared that building a team of graphic recorders with different art styles has been rather interesting. 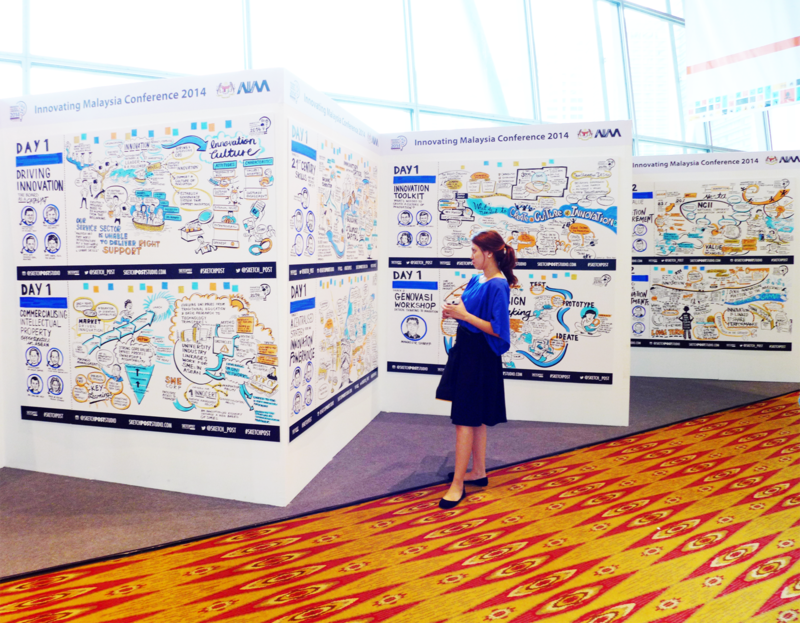 “We’re all talented illustrators and directing our skills into graphic recording has been a journey. We do have distinct illustrations styles but for our professional work, we streamline by using standard black outlines and flat colour. Watching our team mature as designers is a joy to watch,” said Bernie. When it comes to presentation slides, workshops and conferences, a trouble they all have in common is the lack of impact due to the theme being too dry and infomation-heavy. Without the right enthusiastic voice or a much needed jolt of coffee, it’s easy for the audience attending these presentations to just zone out. Pictures, videos, and infographics are all testaments to the power of visual learning. So what Sketch Post specialises in is using graphic recording to combine words and images in a fun format that the general mass can relate to and help stick the ideas in the minds of guests. “Some people are better able to translate or remember information when visuals are involved. For myself, graphic recording is a no-brainer compared to taking primarily text-based notes. Drawing simple pictures is actually a much quicker and more efficient way to capture ideas than to capture them word-for-word,” said Bernie. 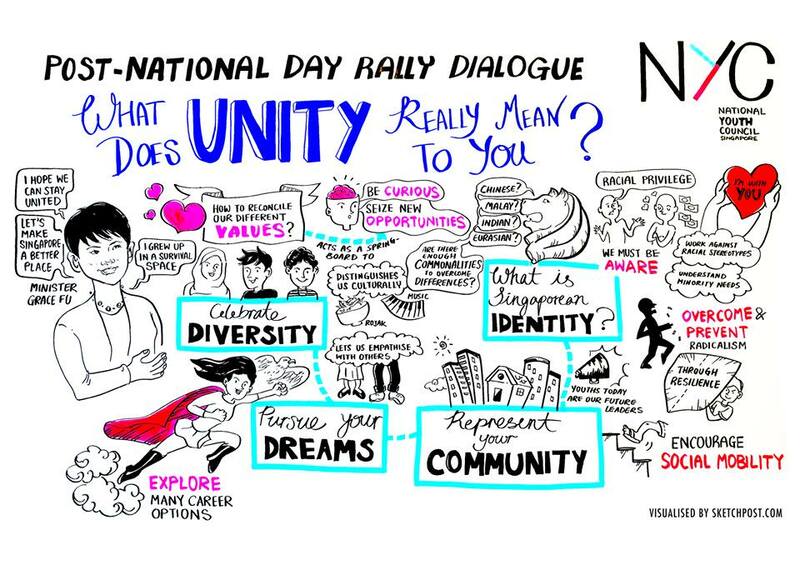 In order to create this visual content, the graphic recorders listen for key ideas in a conversation. They’re trained to recognise verbal cues to identify these key ideas and quickly replicate them through drawings. It is like speaking a different language—a visual language. This skill helps them to capture the essence of a live presentation in a short amount of time. 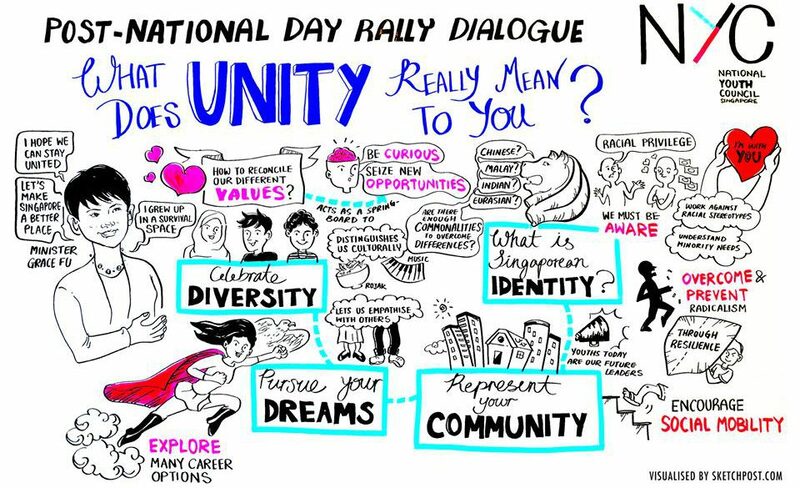 “Graphic recordings are so fresh, in fact, that much of their appeal resides in watching the process itself unfold. Many who witness it for the first time sit up and wonder, ‘Hey! What’s going on over there?’. Also, graphic recordings boost social media engagement, as they are ready for guests to photograph then post, tweet and share immediately,” said Bernie. She expounded that graphic recordings are not meant to be complete summaries or even self-explanatory pieces of information design. They are quick summaries of sessions that guests can instantly use as references for discussions. The compilation is great to include in reports and press releases. “Of course, not everyone is primarily a visual learner. 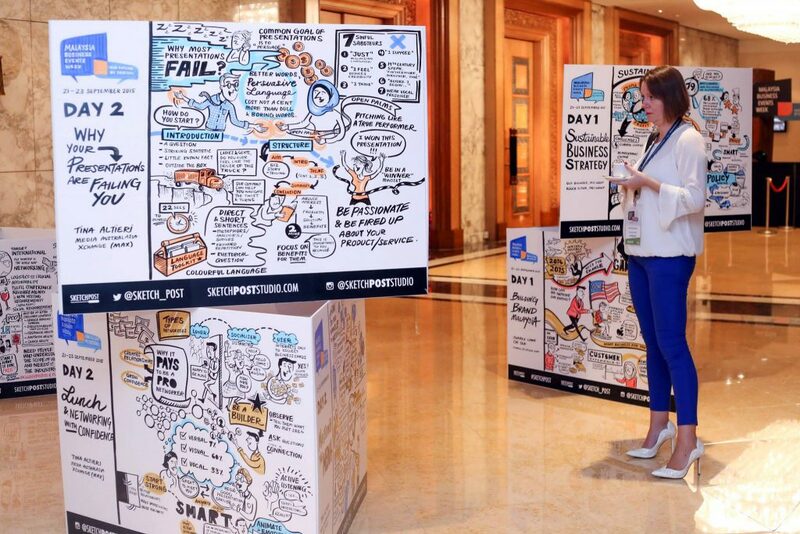 But graphic recordings’ combination of pictures and words is novel, compelling, and memorable—and it gives content marketers an engaging way to test a new medium on their audiences,” said Bernie to Vulcan Post. To engage their services, you can contact Sketch Post directly with what you have in mind for your presentation and they’ll let you know their rates. They charge in MYR, SGD, HKD and USD. “About 90% of the design is done before a speaker walks off the stage. Then we’ll spend some time during breaks to complete the remaining 10% such as colouring, adding words and so forth,” said Bernie. The time frame of how fast they can finish a piece of art depends on the complexity of the artwork as well as the information included. Part of the challenges they face happens to be flying around back-to-back for events in different countries, which can be a strain on the team and their personal lives so they try to keep that as a rarity. 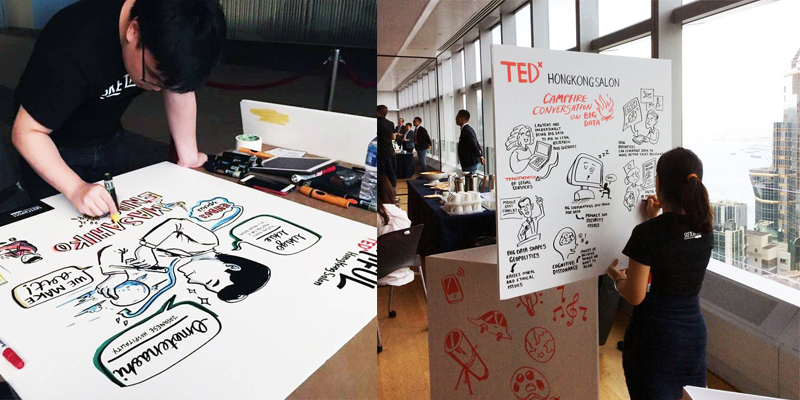 The trickiest part that comes with their sketches is that most of their events are for financial and professional institutions and involves a deep dive into their world. Sketch Post does research on the topic of discussion and themes of each event to familiarise themselves with jargon or common phrases that they may be not used to. Foreign accents can also be tricky to capture and synthesise. Beyond graphic recording, half of their projects are virtual work (infographics and animations) that allows them to work with clients that don’t necessarily host events but have information to visualise. This is part of their business that has grown a lot so they see a potential in enhancing their skills in these areas. Bernie may have started Sketch Post as a small business to experiment with graphic recordings on a professional level but now she has taken it beyond an interest that she pursued during her free time and made it into a business that has taken off with a growing team. 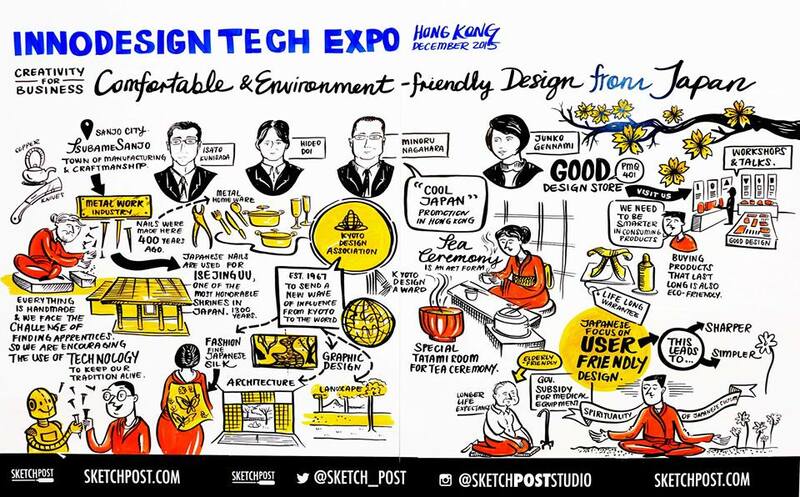 “After establishing Sketch Post in Singapore and Malaysia in 2013, we branched out to Hong Kong as well in 2014. Also, graphic recording workshops to teach students and professionals basic skills are in the works,” said Bernie.